Are you looking for an emergency dentist in the Colony? You’ll get better care if you choose a practice that incorporates modern imaging methods in its treatment approach. Intraoral cameras, digital cameras and light-based cavity detection can all help you to achieve better results faster. How many of us remember old-fashioned film cameras? They were the mainstay of photography enthusiasts for over 100 years. But, while they could take beautiful pictures they also suffered from many disadvantages, including the need to use costly and time-consuming development processes. That’s probably why digital cameras have now become the standard. This same technology has transformed the way dentists take x-rays of their patient’s teeth and facial bones. Digital x-ray machines avoid the hazards associated with toxic chemicals while producing clearer, more precise images. Intraoral cameras use a small, camera-enhanced device to capture precision images of your teeth and gums. 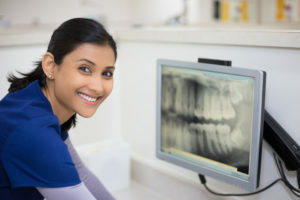 Not only does this technology enable your dentist to diagnose dental problems more effectively, it allows the patient to see exactly what’s going on in his or her mouth. Part of correcting a dental health issue is catching it as soon as possible. In the past the only way to do this was for the dentist to perform a painstaking, time-consuming visual examination. But even the sharpest pair of human eyes may fail to catch a problem before it develops into a serious condition. Pockets of decay in between teeth, underneath restorations and in other places that might otherwise go undetected. Tumors, cysts and abscesses in their earliest stages of formation. Problems in the patient’s facial structure, such as thinning or eroding bones that could threaten the integrity of both natural teeth and restorations such as implants and bridges. The benefits of this new technology go beyond early detection. Digital images can be viewed instantly on any device, including laptops and tablets. They can be enhanced to bring out details that offer valuable diagnostic clues. They can be transmitted directly to other dental professionals across the globe, enabling a timely second opinion. You may be shaking your head and thinking, “all of this sounds great. but i bet it cost a fortune.” If so, then we’ve got even more good news. These imaging advances not only improve patient experience and treatment results, they can actually save money by preventing needless procedures and speeding the diagnostic process. This translates into benefits for your budget as well as your dental health. Not all practices have these technologies yet. That’s why it’s important to check around before settling on an emergency or children’s dentist in the Colony. A few minutes spent doing your homework can offer big payoffs for you and your family. Doctor Austin Amos earned his DDS degree from the University of Texas School of Dentistry in Houston. He keeps his skills sharp by investing in continuous training as well as the latest diagnostic and treatment equipment. You can reach his office online or by calling (972) 625-4746.